According to poll by state pollster, 42 percent surveyed said the Greenpeace protest in the Arctic was plotted by foreign intelligence agencies and governments. State pollster VTsIOM released survey results Monday regarding last month's Greenpeace protest in the Arctic that indicate more than a third of Russians believe the protest was a foreign plot and more than two-thirds disagree with the group's message of needing to protect the environment from oil drilling. 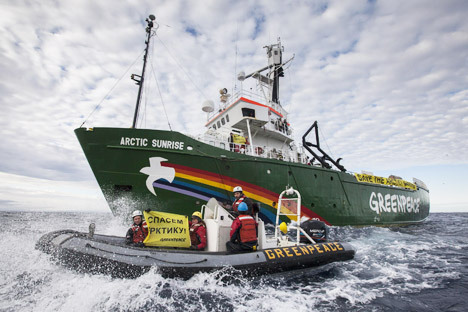 Armed Russian coastguards forcibly boarded Greenpeace ship the Arctic Sunrise on Sept. 19 and arrested 28 Greenpeace activists of 19 nationalities, as well as a Russian photographer and a British videographer, all of whom were charged with piracy. Greenpeace said the activists tried to place the organization's banner on the Prirazlomnaya offshore oil platform, owned by state-run energy giant Gazprom Neft, to protest oil drilling in the Arctic. Last week, the Investigative Committee replaced the piracy charges with hooliganism, reducing the maximum punishment the defendants face to a seven-year prison sentence from piracy's 15-year term. While the charges against the environmentalists have been softened, a large part of Russian society seems to be firmly against their activities. According to the VTsIOM poll, 74 percent of Russians think it is important to exploit the Arctic further, and 42 percent said the Greenpeace action was plotted by foreign intelligence agencies and governments to take Russia's natural resources and territories in the Arctic. Only 20 percent of respondents said the protest was an attempt to save the Arctic environment and 27 percent said it was a PR move. The poll of 1,600 people was conducted Oct. 12 to 13 in 42 regions and has a margin of error of 3.4 percent. The poll results may partly reflect how the affair has been covered on state-owned television — which has given prominence to the Russian authorities' stance — as the vast majority of Russians rely on television for the news. The Investigative Committee said last week that additional charges could be brought against some of the Arctic Sunrise crew members, such as disobeying officials' orders. Interfax, citing an unidentified source in the Murmansk branch of the Investigative Committee, reported Monday that some activists could even be charged with piracy again. But Greenpeace lawyer Anton Beneslavsky said by phone that it was unlikely that the activists would face renewed accusations of piracy. "The Investigative Committee is keeping its next steps secret, but it would be complete nonsense to bring piracy charges again," he said. The piracy charges sparked an outcry internationally, with foreign governments and a group of Nobel Peace Prize laureates having called on Russia to drop them. Foreign Minister Sergei Lavrov told reporters Monday that the detainees "knew what they were getting themselves into" and that their fate should be decided on the basis of international and Russian law. "Whether the Arctic Sunrise crew members are guilty or not will be determined on the basis of international norms, first and foremost the UN Convention on the Law of the Sea, as well as on the basis of Russian legislation," he said, Interfax reported. The International Tribunal for the Law of the Sea, established by the UN Convention on the Law of the Sea in 1982, will start hearings on the Arctic Sunrise case on Nov. 6. The Netherlands, where the Arctic Sunrise was registered, made a complaint to the organization with a request for Russian authorities to release the vessel and free its crew members. Member states are obliged to follow the decisions of the tribunal, based in Hamburg, Germany. Though Russia has been party to the convention since 1997, it refused to send its representatives to the Arctic Sunrise hearing, saying it did not recognize the tribunal's authority for mediating the dispute in this case.